University of New Hampshire Manchester is a commuter campus which serves a diverse population of students, both traditional and non-traditional. Due to the student demographic of the college, along with a general focus on experiential education, it is extremely important for Manchester students to consider study away opportunities. For some students who still live at home, study away is not only their first time out of the country, but out of New Hampshire and away from their families for an extended period of time. This might be a very significant stretch out of their comfort zones. Understanding this, the UNH Manchester community of faculty, staff, and study away alumni collaborate to spread the word about international programs both to assist those who may be thinking about studying away and to reach students who may never have considered an education abroad program. 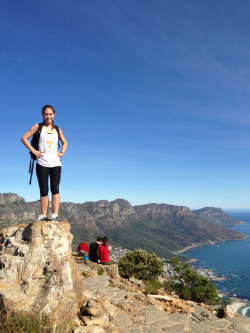 Kellie Howard (Biological Sciences and Psychology ’12) had heard of students studying abroad, but assumed that she would never have the opportunity since she had a demanding course load and came from a low socioeconomic background. With encouragement from faculty and staff, Kellie made it happen. She applied for and was awarded two scholarships and one grant (a UNHM Study Abroad Scholarship for $4000, a Center for International Education Study Abroad Scholarship for $1000 and a Semester at Sea Grant for $750) to offset the cost of her chosen study abroad program, Semester at Sea. She traveled and took courses related to the seven countries she visited (Bahamas, Trinidad, Panama, Costa Rica, Honduras, Guatemala, and Belize). Upon her return, Kellie was inspired to continue to engage internationally. She travelled to Latin America over spring break to work with a medical team, helping to serve 80-100 low-income people a day in a medical clinic. She also used her international experience as her capstone project, and presented this project at the 2012 Undergraduate Research Conference. 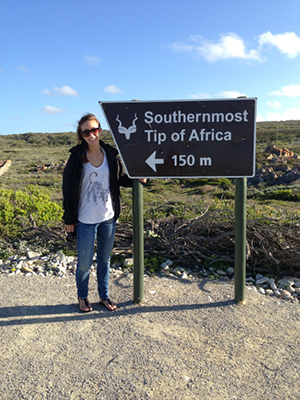 During her final summer at UNHM, Kellie also interned in Cape Town, South Africa, working at a pediatric hospital where she shadowed doctors and did research. By the time she graduated from UNH, Kellie had a resume full of academic and co-curricular international experiences that she had never thought would be available to her, and which launched her on her chosen career path in medicine. Kellie is currently completing her MCAS and medical school applications for admission in September 2015. Before she begins such an intensive study, she will be heading to Europe for a backpacking adventure through London, Amsterdam, Rome, Naples, Barcelona, Dublin and Paris. Clearly, studying abroad has opened many doors for Kellie. She is an inspiration for internationally-minded students at UNH Manchester.